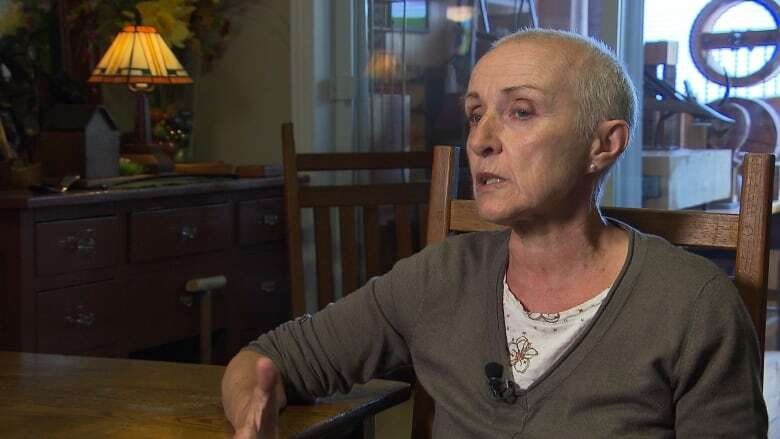 An investigation has been launched after Montreal cancer patient Sylvie Dubé learned a 33-centimetre metal plate was left inside her during a hysterectomy, causing her severe pain in her shoulder. Sylvie Dubé couldn't figure out why she was overcome with pain in her shoulder after she woke up following an operation at a Montreal hospital for ovarian cancer. "It felt like I had been stabbed," Dubé told Radio-Canada, recalling the surgery on March 14 at Notre-Dame Hospital. The medical staff and her doctor told her it was normal to experience pain in other parts of the body after a hysterectomy, said Dubé, who is in her 60s. The pain didn't subside, so she met with a specialist and had her shoulder X-rayed. They found nothing wrong. "Everything was normal," she said. While starting another round of chemotherapy, Dubé turned to anti-inflammatory medication and underwent a dozen cortisone injections to ease the agony in her shoulder, but nothing worked. "The pain was too intense." As weeks went on, the pain worsened and Dubé became anxious. "It's really tough when your girlfriend is crying because she says 'it really hurts,'" said Alain Cadieux, Dubé's partner of 35 years. Feeling discouraged, the couple showed up at the emergency room at Notre-Dame Hospital more than two months after the surgery, on May 22. That's when Dubé underwent an X-ray. 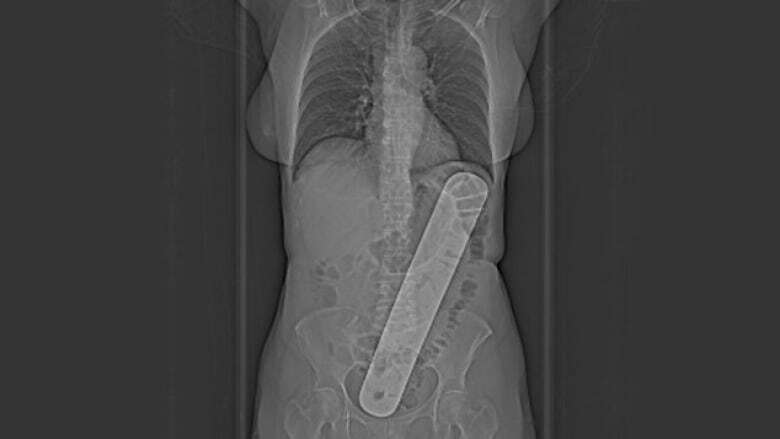 Puzzled radiologists told her there was a large medical instrument lodged inside her stomach. "She told me, 'We see a metal plate that's 30 centimetres in your stomach,'" Dubé said. "I said, 'I don't have a metal plate in my stomach.'" The medical report confirms the plate was left inside Dubé's body during her hysterectomy nearly two months earlier. Dubé said the plate is used to protect the stomach and intestines during an operation and that it is usually the last surgical item to be removed. Following the discovery, Dubé underwent a second surgery on May 25 to remove the metal plate just a few days after another round of chemotherapy. The couple also filed a complaint with the hospital to ensure something similar doesn't happen to other patients. "It's a rare situation, I know, but it's an event that can happen," said Dubé. 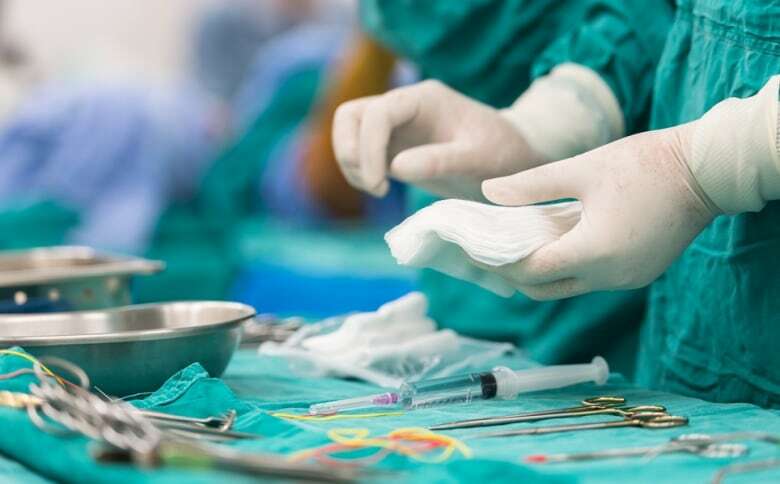 The Centre hospitalier de l'Universite de Montréal (CHUM), the network that oversees Notre-Dame Hospital, has since launched an investigation to understand what exactly happened the day of Dubé's hysterectomy. "It's something that remains exceptional," said Dr. Charles Bellavance, director of medical and university affairs at the CHUM. Every Quebec hospital has a set of similar procedures to avoid leaving medical instruments inside patients. Before the operation, a member of the surgical team reads aloud the list detailing each instrument and compress. The same count is carried out once more when the operation is over. If something is missing, the patient undergoes an X-ray to ensure no instrument was forgotten inside before they leave the room. Quebec Health Minister Gaétan Barrette called it an "unfortunate" situation and said that all operating rooms come with risks. "Everything is counted and recounted at the end to make sure that nothing stays inside the patient," Barrette said. "And in this case, it was the recounting process that didn't work." Sources told Radio-Canada that nurses are responsible for counting the instruments, but Bellavance said operations as a whole are "teamwork." "We're investigating everything that happened," said Bellavance. 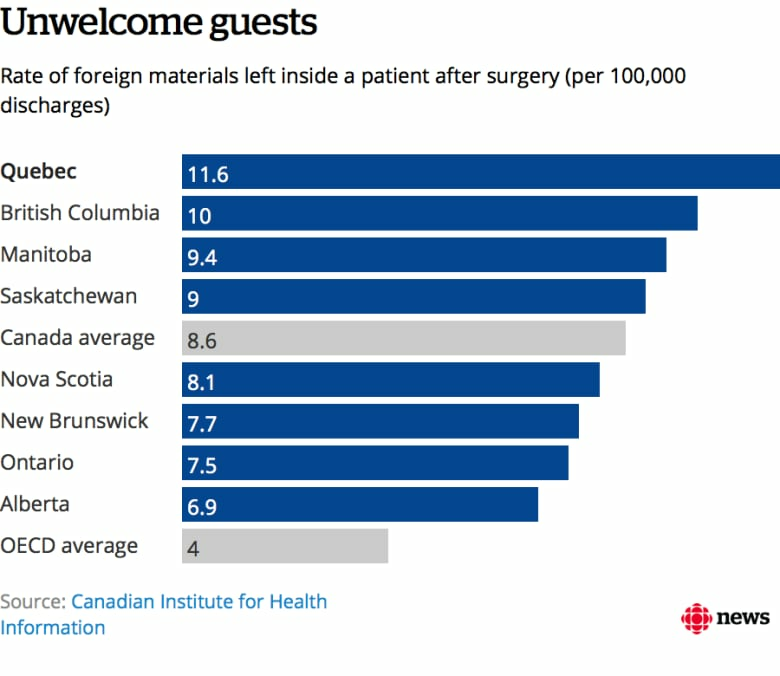 While forgetting to remove instruments during surgery and other medical procedures is rare in Canada, Quebec is the province with the highest number of recorded cases. The national average is about 8.6 cases out of 100,000, but Quebec reports 11.6 cases out of 100,000, according to the Canadian Institute for Health Information (CIHI). Dubé's experience has since prompted changes at the CHUM's entire hospital network. Surgical teams have been given a memory aid that has more elaborate counting and recounting procedures for operations to make sure that no medical equipment is left behind. The CHUM will also oversee how the changes are working in the coming months.